THE PREP SCHOOL is located at 525 West 17th Street in Bloomington, IN at the corner of 17th Street and Jackson Street. Since 1988, The Prep School has served the Bloomington community by developing an innovative academic program for its younger citizens, ages 3 to 5. The vision of THE PREP SCHOOL is founded on a strong academic curriculum in which children are respected as individuals and curriculum is differentiated for each unique individual. In addition, at THE PREP SCHOOL, we also believe in educating the whole child, focusing not only on a strong belief in cognitive development and academic success, but also on social and emotional development and success as students move through the natural stages of growing up. Cognitive, Social, and Emotional development and growth in these areas make up a “whole child” – a.k.a. the backbone of our organization’s vision. At THE PREP SCHOOL, we are able to offer curriculum based on educating the whole child due to our low student to teacher ratios, due to our teachers who are licensed or exceptionally qualified and who are highly dedicated to the children, the families, and our organizational vision, and due to the past twenty years of experience in which whole child education has been our school’s vision. As the years have passed, we have received accolades from our past and current families, from the community, and from experts in the field of education that our school’s vision of educating the whole child is the RIGHT way to educate children. The vision of THE PREP SCHOOL is founded on the belief that learning will be authentic and experiential. Students interact with REAL people, places, and things to gain the hands-on experiences that all learners need when making connections with and building meaning about the world in which they live. As we learn about our community, we visit local businesses and host community leaders and professionals as weekly speakers as they share their experiences versus just seeing pictures in a book, movie, or on the internet. In addition, materials provided to students are rich and real. Again and for example, instead of just looking at a picture of a persimmon, students experience an actual persimmon, in which they can use their five senses to authentically touch, smell, hear, see, and taste its characteristics. In addition, in our classroom communities, students are exposed to the democratic beliefs that founded our country. Whether they have rules to set and follow, jobs to complete, and/or choices to make, our students experience the ideas of a democracy. Another part of authentic learning at THE PREP SCHOOL incorporates students being exposed to several of the Fine Arts, which includes Spanish, music and instruments, physical education, and other unique curricular areas in order to build a stronger brain connection to these academic areas. In addition, students are also introduced to many subject areas including literature, math, science, art, and others, in order to start building a foundation of this material and because we believe learning cannot be compartmentalized. Instead, and as often as possible, learning will be holistic and integrated among all subjects. Because of this, students will use diversified learning materials to advance individualized skills. The vision of THE PREP SCHOOL is founded on the belief that the natural partnerships created between families and teachers are crucial to the success of our program. We look forward to hearing from parents and seeing parents on a regular basis. We recognize and embrace the fact that parents are an equal partner in their child’s education and we encourage parents to take an active role in their child’s education. Newsletters are provided weekly to families and our web site always has the most up-to-date information regarding school happenings and school policy and procedure information. Teachers prefer to have daily conversation exchanges with family members, but emailing and writing personal notes are encouraged as alternate forms of communication. Our organization would not be what it is today without the endless support and respectful feedback from our families. Based on what you have just read, as we move forward at THE PREP SCHOOL, the principles of Educating the Whole Child, Authentic Learning, and Respecting Family Partnerships are the three main principles of our organizational vision. These principles will be the driving force for our organization as we plan our future goals and make our future decisions. By Monday morning of each week, your child’s teacher will have a weekly classroom newsletter for you to read – this newsletter will be sent to your family’s email addresses on file. This newsletter lists the weekly curriculum objectives for the classroom, upcoming events and deadlines, homework details, and other important events. PLEASE read your child’s classroom newsletter EVERY WEEK!! By doing this, you will stay abreast of the happenings in your child’s classroom. If you have questions about anything in the weekly classroom newsletter, be sure to ask your child’s teacher. In addition, on the first day of school, you will receive a Welcome Letter from your child’s teacher which discusses all nuances of this classroom. Please read through this information to better understand your child’s day at The Prep School. There is also a ROLLING CALENDAR found on our website which is kept up-to-date! Feel free to check this out at any time! 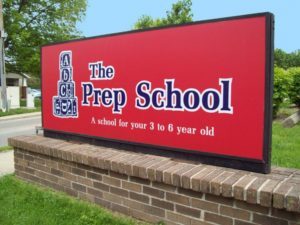 The Prep School offers a strong, academic curriculum in which the students work at their own pace and on an individually designed program; a positive child centered environment in which students explore the activities that make up their world; and valuable peer interaction skills in which students will make friends and resolve conflicts successfully. During the week, The Prep School’s curriculum may also be enriched with Music, Spanish, Library, Art or PE classes. At The Prep School, class time curriculum involves math, reading readiness, science experiments, movement activities, art projects, food projects, music activities, circletime and games surrounding a particular letter of the week. Each student also enjoys learning through their play in one of our educational centers. Stop by The Prep School, located at 525 W. 17th St for a better look at Bloomington’s finest preschool. (We are accredited by the State of Indiana – School Number C-918). At The Prep School, a student’s progress is evaluated informally on an on-going and daily basis. We also provide formal evaluations to the family in early December and again in mid-May. Evaluations consist of age- and developmentally-appropriate skills and criteria. After evaluations are provided to the family, family-teacher conferences are available to further discuss the evaluation and its content. The school day at The Prep School is officially 9:00 a.m. to 4:00 p.m. However, The Prep School provides before school care from 7:00 a.m. to 9:00 a.m. and after school care from 4:00 p.m. to 6:00 p.m.
During the official school day, your child is involved in academic and structured activities that revolve around a Letter of the Week, Theme of the Week, or Book of the Week and the teachers of The Prep School integrate all curricular areas (reading, math, science, movement, music, art, etc.) into this Letter, Theme, or Book. In addition, during the school day, students will have outside time, free choice center time, lunch time, nap time (for 3’s and 4’s POD only) or quiet time (for 5’s only), and Specials times (Spanish, Music, Movement, etc.). Your child is with his/her “homeroom teacher” for the entire period of 9:00 a.m. to 4:00 p.m. (unless your child is in Specials or your child’s teacher has a scheduled lunch break). Check out your child’s classroom’s daily schedule for more details about the school day. The classroom schedule will be sent to you via email from your child’s teacher on or before the first day of school. For rest / naptime in the 3’s POD and 4’s POD, it is important to have your child bring a small blanket and small pillow. In addition, “nappers” can bring a stuffed animal or comfort item to snuggle with during rest / naptime. Please label items brought from home. For the 5’s, they do not have a naptime – only a quiet rest time – during this time SOME 5’s POD students might take a “snooze” and SOME 5’s POD students might not. It is up to the family to decide if you want your 5’s POD student to take a “snooze”. If this is the case, please bring in nap items for your child. During the before school and after school programming, your child will most likely be with other teachers from the POD, until your child’s teacher arrives or due to your child’s homeroom teacher’s work schedule ending earlier than your child’s pick-up time. In addition, the before and after school programs might be in separate rooms than your child’s normal home room. The before school and after school programs are more relaxed and during this time, students will be a part of play activities, book time, outside time, and more. At the beginning of the school year, we will help you locate your child is during drop off and pick up times. Just ask any staff member and they will help direct you to your child during the before and after school programs. At The Prep School and as part of your tuition cost, your child is provided breakfast, lunch, and two snacks. Breakfast is served between the hour of 7:00 a.m. and 8:00 a.m., if your child wants breakfast. Breakfast consists of cereal, milk, and juice. Snack is served once in the morning and once in the afternoon. Lunch is served between the hours of 11:30 a.m. and 12:30 p.m. Check your child’s daily classroom schedule to find out when your child’s lunch time is scheduled. For lunch, your child can choose between two lunch options – one option is always a “hot” option and one is a “cold” option. When you arrive in the morning, be sure to sign up for one of these lunch items – the lunch sign-up sheet is located in your child’s classroom. If your child has special dietary needs and you would prefer to “pack” your child’s lunch, this is an option. We do not have the equipment to “cool” or “heat” your child’s packed lunch, so you would need to plan for this when choosing your child’s food options and when packing your child’s lunch. There is a form you will need to complete and sign, if you plan on bringing your child’s lunch. Let me know if you need one of these forms.